Here’s an odd thing. Yesterday’s post included, amid the usual consignment of unengaging rubbish, an A4 envelope addressed in an unfamiliar hand. Curious, I opened it. I was standing at the sideboard in our dining room. Although the house itself was quiet, a few feet away I could see, through the windows, the colourful, cheerfully profane West End multitudes surging by, intent on their lunchtime errands, vital and mundane, oblivious to anything except each other and, perhaps, the mildly surprising warmth of the late summer sunshine. Inside the envelope was an older envelope. Within that, there was a letter. And this, at last, I recognised immediately. Those downstrokes, deliberate, looping and inky, said all there was to say. 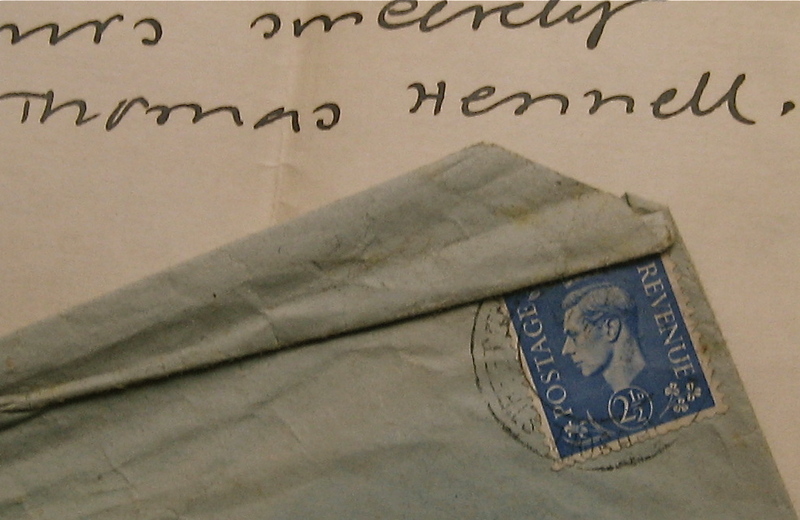 The letter, I learned, had been written in November 1944 by Thomas Hennell — English poet, essayist, illustrator, and painter in watercolours. And Hennell, in turn, had almost certainly died in November 1945 in what used to be Batavia, killed by Indonesian nationalist rebels while observing the conflict there in his role as a British war artist. I felt strange, standing there, holding a letter from someone both so long dead, but at the same time, someone whose work now occupies such an important place in my thoughts.